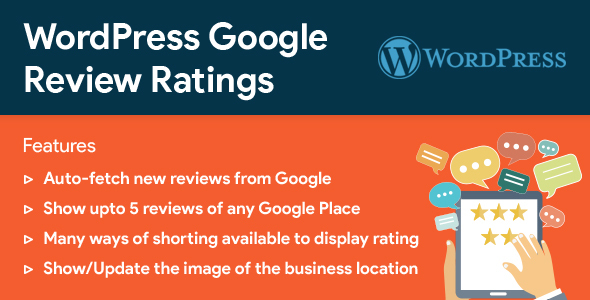 One of the Best Premium WordPress Plugin for display Google Reviews & Ratings of Business places which provide to display more than 5 business reviews and improve efficiency. Easily fetch Google Places and near areas location and here you can change location image also. WITH GOOGLE REVIEWS IN HAND, YOU’LL..
It’s save your time and show you positive Reviews, Ratings and Testimonials. You can allow your customers to say their words on your website with Write a Review Button. Leave a Good Impression to your Customers & Audiences for better brand Awareness. Show upto 5 reviews of any Google Place. Use multiple times in a page. Many ways of shorting available to display ratings. Show/Update the image of the business location. Show/Hide See all reviews button. Show/Hide Add a review button. This plugin provides Google reviews in Slider,with few slider settings Like number of reviews to display and speed of slider etc. This plugin provides Google reviews in Grid Section,with few settings Like number of reviews per row. Google Badge will provide left and right side options which stay sticky on page and on click of badge that will open google reviews on left or right side of selected badge.